Here’s a very different take on the intersection of activism and art. 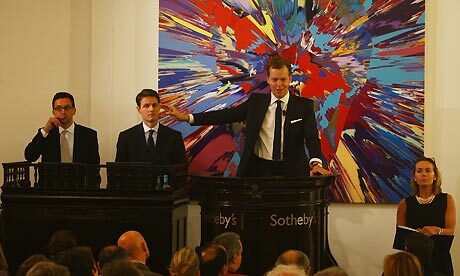 Protesters aligned with Occupy Wall Street disrupted an art auction at Sotheby’s, because the company has locked out its art handlers in an attempt to shrink its numbers of unionized workers and curtail benefits — despite record profits. As reported on truth-out.org, a number of activists stood up during the auction and shouted out facts about this unjust lockout, before being escorted out of the building.